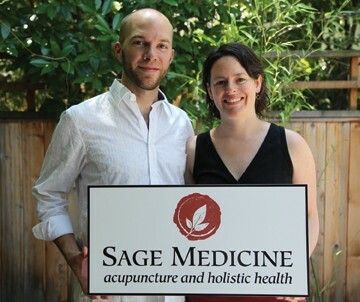 David & Erin Kaminker, co-owners of Sage Medicine, are both Licensed Acupuncturists with a Master of Science in Oriental Medicine. They have been working together for 10 years and just opened their new clinic in Ashland. David and Erin support their patients in achieving optimal health so they can live richer, more fulfilled lives. We were able to sit down together and discuss their practice, philosophy, and approach to holistic healthcare. David & Erin, thanks for taking the time to speak with us today. To begin, can you please share your inspiration of how you both became Acupuncturists? Erin: At the age of 18, I was blessed to work with an amazing healer, Sue Moon. Sue introduced me to the profound world of healing arts. From her, I received various forms of energy healing, including shiatsu, massage therapy, Reiki, and guided meditations. After working with Sue, I knew that I wanted to follow in her footsteps, but I needed to understand the human body and energy field at a much deeper level. I spent the next 10 years studying and exploring different modalities to find which approach was right for me as a practitioner. I found that acupuncture is the most direct way for myself to understand the complex energy systems of the human body as well as one of the most effective ways to help my patients evolve spiritually, emotionally and physically. David: When I was 15 years old, I experienced “qi” for the first time. My brother and I went to our first tai ji class. I remember so vividly the feeling of qi emanating from my hands. I started to stay up late at night, doing tai ji and meditating, trying to get a grasp on this new dimension of my being. This was the beginning of my devotion to exploring the human body and energy field. Today, in my practice of acupuncture, craniosacral therapy, qi gong, ba gua zhang, or meditation, I often still feel that same child-like amazement and curiosity that I felt when I was 15. My desire to understand the human body-mind-spirit is still insatiable. Originally you had both been trained as massage therapists and then decided to take things to a new level when becoming acupuncturists. What advantages does this allow you to bring to the table? Erin: We are very fortunate to have a background as massage therapists. We gained a strong knowledge of human anatomy and physiology early on in our training, and therefore, are very comfortable with the physical body. We have been massage therapists for 10 years, integrating Swedish, deep tissue, shiatsu, and craniosacral therapy. We now offer a deluxe hour-and-a-half treatment combining acupuncture and therapeutic massage. This combination is very effective for chronic musculoskeletal problems, such as back pain, sciatica, and rotator cuff injuries. We are able to achieve longer-lasting results by using various massage techniques in our treatments. You both had the opportunity to study and work with Paul Pitchford, the world-renowned author of Healing with Whole Foods. As I understand it, you incorporate nutritional wellness into your practice? Erin: Yes, the training we did with Paul is based on whole-foods nutrition, which integrates Asian traditions and modern nutrition, and is still at the foundation of what we offer our patients today. In our practice, we first perform a thorough consultation to gain valuable information about each patient. This includes a health history interview, tongue and pulse diagnosis, abdominal palpation, as well as specific observations of the patient. We use Traditional Chinese Medicine and Five Element Theory as a framework to assess each person’s condition. We then make nutritional recommendations based on each individual’s diagnosis and constitution. The nutritional education you offer sounds like a very individually oriented process. Erin: Yes, we work one-on-one with each patient, guiding them to their optimum health. We understand that human beings come in many different shapes, sizes, and constitutions, so what is right for one person may be wrong for the next. This is how beautifully Chinese medicine works. It’s not “cookie-cutter” medicine. It honors the uniqueness in each of us, and allows us as practitioners to get to the root of a condition rather than just treating symptoms. I understand that Sage Medicine has a fully stocked Chinese herbal apothecary in which you custom-make formulas for your patients. How do you use herbs in your practice? David: Chinese herbal medicine is unique in that we create formulas for each patient, based on their individual constitution. In our pharmacy we have over 150 single herbs to choose from when making a formula. When using Chinese herbs, there is not only one herb or one formula that is appropriate for treating each symptom. For example, a patient whose main complaint is insomnia might receive a completely different formula than someone else who also has insomnia. There are over 20 different formulas used to treat insomnia. The formula we prescribe for each patient depends completely on the individual’s diagnostic pattern. Once we narrow down which formula to use for each patient, we can modify the individual herbs and adjust the dosages to best accommodate the individual. So it sounds like you are prescribing herbs to treat the whole patient rather than isolating each symptom. David: Exactly. One advantage of Chinese herbal medicine is that we can diagnose and treat the underlying imbalance that causes the symptoms. This is quite different from Western herbalism, in which herbs are primarily thought of in terms of the symptoms they treat. However, we also use Western herbs in our practice. There are many times when we feel it is appropriate to use this approach. Erin, you stated that you specialize in women’s health. Can you please tell us more about the work you do? Erin: I am passionate about women’s healthcare. It is a great joy is to assist women in achieving homeostasis throughout the different phases of their lives. Whether it’s helping a woman regain her menstrual flow, supporting her through pregnancy, or reducing menopausal symptoms, I am privileged to facilitate the process. Can you talk a little bit more about your personal approach to women’s health? Erin: I have a very gentle approach to healing and I love nurturing the feminine within. I believe that many of our imbalances as women come from the lack of love and attention we give ourselves. We are so busy taking care of everyone else that we forget about how important we are. Receiving regular acupuncture treatments is one of the best things we can do for ourselves to help regain our feminine balance. Erin, why did you decide to incorporate facial rejuvenation into your services? Erin: I believe that feeling beautiful and rejuvenated can be just as important as treating a backache or getting to the root of chronic ailments. When I myself receive a restorative treatment, such as a massage, facial, or body wrap, I feel renewed, as though all my worries have been washed away. So I decided several years ago that I would incorporate a treatment that was simply to make a person feel nurtured, youthful, and rejuvenated. I understand the facials you offer include microcurrent technology. Can you share more about what makes your facials unique and how they work? Erin: My facials incorporate a state-of-the-art microcurrent machine that stimulates the deeper muscles and acupuncture points on the face. I use specifically designed probes that painlessly glide over the skin, while emitting micro amounts of electrical stimulation. This procedure stimulates cellular regeneration, improves collagen production, and enhances circulation. The cosmetic benefits include a reduction in fine lines and wrinkles, toning and lifting, and improved complexion. You mentioned that microcurrent affects acupuncture points on the face. How is this important to the treatment? Erin: The face contains many powerful acupuncture points, which connect with the primary meridians throughout the body. Stimulating these acupuncture points with microcurrent not only enhances outer beauty but also can restore internal balance. Symptoms of internal imbalance are often reflected in the face as dark circles, puffiness, sagging muscles, drooping eyelids, and excessive wrinkling. Therefore, microcurrent facial rejuvenation can address underlying conditions, such as digestive problems, hormonal imbalance, chronic fatigue, and emotional stress. The key is creating outer beauty through internal balance. Is there a protocol for how often someone should receive this type of facial treatment? Erin: These treatments have a cumulative effect, just like acupuncture. For best results, clients should receive microcurrent once a week for a series of 10 sessions. For more permanent results, maintenance is recommended every four to six weeks or as needed. It is a great way to treat yourself for a holiday or special event. Gift certificates are also available. David, you practice Japanese acupuncture? How does this differ from Chinese acupuncture? David: I have extensive training in one particular form of Japanese acupuncture, from the Ki Shin Po tradition. The Ki Shin Po lineage is based in all of the same classic texts and meridian theory as Chinese acupuncture. The primary difference lies in the techniques. This is a very gentle style that uses insertion of the thinnest possible needles to achieve an effect without causing discomfort. It is also known for its “non-insertive needling” techniques, where a round-tipped needle is used on the acupuncture point, without penetrating the skin. Japanese acupuncture is deeply relaxing, restorative, and transformational. David, what exactly is craniosacral therapy and who can benefit from it? David: Craniosacral therapy is derived from osteopathic medicine. The techniques intend to bring fluid movement and optimal function to the joints, tissues, and organs relating to the central nervous system. However, the techniques are really a gateway to access the physical, energetic, and emotional state of the entire body. While receiving craniosacral therapy, patients often experience a process know as “unwinding,” where the body engages in spontaneous, effortless movements, sometimes accompanied by emotional release. In my personal experience, craniosacral therapy is appropriate for anyone who has experienced any kind of trauma. I have treated a lot of people with traumatic brain injuries, whiplash, and back pain. I have also worked with many patients who have had various degrees of emotional trauma, whether it is from childhood abuse, a recent divorce, or any other kind of stressful life event. David, I understand that you also specialize in pain management and somatic emotional conditions. Can you say more about this work? David: It is well documented that emotions can manifest in the body as physical pain and physiological disease. It is even widely accepted in conventional Western medicine that emotions and stress are contributing factors, if not direct causes, of countless medical conditions. I have treated a lot of people who come to me and say, “I have this stubborn back pain that doesn’t respond to any treatment. I’ve tried deep tissue massage, Rolfing, chiropractic, acupuncture, topical herbal liniments, and even pharmaceutical pain medication. Nothing seems to make a difference.” I’ve also heard a lot of people say, “X, Y & Z helped for a few days, but then my symptoms came right back.” Often in these cases, there is some somatic emotional component. When we bring awareness to the underlying emotion, the physical symptoms begin to resolve. Would you mind giving an example of this phenomenon? David: For example, one of my patients, a 61-year-old woman, came to me with debilitating neck and shoulder pain. She was one who tried everything, but with no relief. As we worked together, using both Japanese acupuncture and craniosacral therapy, we soon discovered that her pain was strongly related to grief. Her life partner had recently passed away. She had not yet had the opportunity to fully grieve the loss of her “soul mate.” We realized that her neck and shoulder pain began shortly after his death. Simply bringing this correlation to her conscious awareness allowed her to continue grieving and release suppressed emotions. Finally having a catharsis, in which she felt supported and safe, proved to be the key that unlocked her neck and shoulder pain. Another patient of mine, a 38-year-old woman, had a nagging cough for almost 15 years. She had been to many medical specialists and had been prescribed numerous medications, none of which did anything to help her cough. She resorted to acupuncture and Chinese herbs, but after months of treatment, she had no significant changes in her symptoms. Eventually she began seeing me for craniosacral therapy. During one of our sessions, as her body was “unwinding,” she started to experience some emotions that she did not realize were there. In the moment, it was not terribly dramatic or eventful, however, after the session, the chronic cough that had been with her for years literally disappeared and, to this day, has not returned. Is it normal to expect results like this? David: In my experience, nothing that happens while doing this work is “normal.” Each patient responds differently. At times, the results are bizarre, surprising, and often quite miraculous. Other times, it is more about engaging in the process of bringing awareness to the mind-body-emotion connection. David: Yes, we love working with children. Children respond really well to both acupuncture and craniosacral therapy, often more quickly than adults, as their bodies have had less time to forge unhealthy physical and energetic patterns. We treat a variety of ailments that children experience, like digestive conditions (diarrhea, constipation, and stomach aches), food allergies, colds and flus, disruptive sleep (nightmares, teeth-grinding and bed-wetting), skin rashes, headaches, traumatic injuries and anxiety. For children, we usually use non-insertive techniques; this way, it is painless and does not induce the fear of needles that many children have. Most children really love receiving acupuncture and craniosacral therapy. Talk to us about preventative medicine and how working with acupuncture can support one in maintaining optimal health? The ideal is to treat people long before they have any signs or symptoms, to correct subtle imbalances in the organs and meridians before these energetic imbalances manifest as physiological disease. In order for us, as practitioners, to treat people this way, we need to be given the opportunity. We recommend that our patients come in for routine “tune-ups” or check-ups before their health gets out of hand. Fortunately, this is becoming more and more common. We feel extremely grateful to live in a community where people are so conscious of their health that they notice when they start to feel slightly out of balance. It is our deepest honor to serve people in their healing process. Our passion is to help people live their lives with more grace and joy. Our passion is to help people feel more centered and peaceful in their bodies, so they can experience more love and compassion. Our passion is to help people evolve as human beings, to realize their fullest potential and fulfill their own destiny.